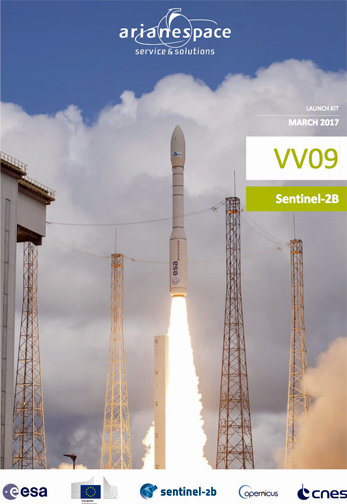 For its third launch of the year, which will be the first mission in 2017 using a Vega launcher, Arianespace will orbit the Sentinel-2B satellite, a part of Europe's Copernicus Earth observation program, on behalf of the European Commission within the scope of a contract with the European Space Agency (ESA). Designed flight VV09, this is the ninth launch to be performed by the Vega launcher since the launch vehicle's first liftoff from the Guiana Space Center in 2012. The launch will be performed from the Vega Launch Complex (ZLV) in Kourou, French Guiana. The Launch Readiness Review (LRR) will occur on Saturday, March 4, 2017 in Kourou, to authorize the start of operations for the final countdown. Sentinel-2B is the fourth satellite in the Copernicus program to be orbited by Arianespace and follows the successful launches of Sentinel-1A by a Soyuz rocket in April 2014, Sentinel-2A by a Vega rocket in June 2015 and Sentinel-1B by a Soyuz in April 2016—all performed from the Guiana Space Center in French Guiana. The Sentinel-2B Earth observation satellite primarily focuses on monitoring land masses and coastal zones around the world. The data will be used for applications concerning the monitoring of vegetation, world’s forest, soil types and habitats in particular by detecting pollution in lakes and coastal waters. The spacecraft features a multispectral, wide-swath, high-resolution optical imaging instrument. Sentinel-2B will be positioned in an orbit opposite that of Sentinel-2A to ensure optimum coverage and data delivery. The pair of Sentinel-2 satellites will cover the Earth’s entire surface in five days. This high frequency means they will capture brand-new views of the Earth, driving considerable progress in monitoring and predicting changes in vegetation and aquatic pollution. Sentinel-2B was built by a consortium led by Airbus.